We're proud to announce the addition of a new podcast to our ranks: Judge John Hodgman. As on the popular Jordan, Jesse, Go! segment, Judge John Hodgman will be settling disputes, big and small. Each week, two disputants will go before Judge Hodgman (and beloved bailiff Jesse Thorn) to have their disagreement settled in a binding and permanent fashion. If you subscribe to John's "Today in the Past" podcast, you'll get Judge John Hodgman automatically. If not, you can follow this link into your iTunes. (The information in the iTunes directory should update within a day or two.) Our transitional episode is already up, and features a classic dispute from Jordan, Jesse, Go!. You can download that show directly using this link. If you use a non-iTunes podcatcher, you can subscribe to the URL http://feeds.feedburner.com/todayinthepast. We'll have a formal launch in a week or so, and we'll get a special page up on the site soon. In the meantime, enjoy the show! 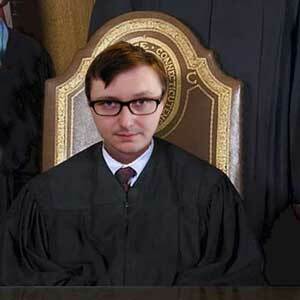 If you have a dispute you'd like to have settled by Judge Hodgman, email it to hodgman@maximumfun.org. We're looking for genuine disputes, big or small. No jokes. I find that you are a scholar and a gentleman, sir, and your words are true and irrefutable. However, regarding your ruling on the Beard Chicken case, I encourage you to revisit your ruling based upon a statement made by McElroy, that may have been overlooked. He stated that "I made a grand declaration of victory, and shaved my beard." To this I say, if Bilder is the "statesman" he claims to be, it was his responsibility to voice his objection with McElroy's "grand declaration" prior to McElroy shaving. This would give McElroy an honest opportunity to continue with the game, and eliminate any further confusion about any ridiculous stipulations. Given that he, Bilder, sat idly by, making no such objection, he himself nullified any prior stipulations that may or may not have been agreed upon. Hence, he did not honor the game of Beard Chicken itself, or the spirit in which he made such stipulations. To name himself the winner at a later date, if nothing else, evidences his non-statesman like character. Mr. Hodgman, I enjoy your show as well as your fresh and flavorful perspective on life. I must say you have me laughing out loud on the train as I travel around Chicago, and I will be in search of your book, "That Is All." Thank you for your unique and hilarious podcast, I am now a devoted listener. Lastly, I found this episode heartfelt, as I have participated in similar contests and am an avid beard grower myself. I just listened to the podcast on the doctor who wanted to do the triathlon, and I have to say you seemed to be channelling Judge Judy in your harshness toward the good doctor. A few good barbs in jest are fun, but you were crossing the line I dare say in the territory of nastiness. It wasn't funny and I turned you off -- a first. Please be more Wapneresgue, and less Judyesque in the future. I will be marching tomorrow at the rally in Madison. I believe you are familiar with this, um, dust up. I will make a sign and post a picture on this web site, I would like you to finalize, "Judge John Hodgman rules....." Please complete, as I have fresh poster board and many colors of markers to use. I am not a smelly hippie, but an aged hippie. aka @hershinmad on the fine social, (whatever the hell it is) on twitter. Pardon me, I've been drinking a number of rum drinks this evening. Rum drinks seem to be the most logical thing to do, as a citizen of Wisconsin no matter who is Governor. Does it sound like it's sped up? or am I just used to the slow talking ways of the South? Where Did Episode 1 Go? Does anybody have a link for episode 1? I'm all OCD like that. Thanks. Was just a clip from the old segment on Jordan Jesse Go. You can find the case in this episode of that show. We put it in the feed to introduce people to what we were aiming to do before we'd done it, and we took it out because once we had "real" episodes, it was confusing people. Lots of folks were starting with episode one and thinking, "why is this show just an old segment from another show"? Where is the full website with the evidence? I NEEDS ME SOME PHOTOGRAPHIC EVIDENCE! PS. This is the best podcast in the history of audio, keep up the good work! I really enjoyed John Hodgman's previous podcast, "Today In the Past," and was sad to see it go. But I warmed quickly to this new one. I love the unique premise and the way it highlights Hodgman's trademark wit. Unfortunately, I was quite put off by a comment he made in the "Tear Down This Wall" episode, which was a completely gratuitous and offensive jab at Catholic believers. I hope that future episodes will be more lighthearted and less hostile to folks who don't share Hodgman's religious (or non-religious) views. Meanwhile, I'll keep listening and hope that he keeps bringing the funny! John Hodgman has always been one of my favorite humorists. Now, I am enjoying this podcast so much, it is forcing me to smile like a stoned dolphin even on the crappiest days. The Hon. J.H. is truly a wise man. His verdict on the "giraffe robot" brought a tear to my eye. And I like the bailiff too. He provides the right amount of color commentary. Well done! As they say on the Internets, MOAR! Mr Thorne[sp?] does _not_ sound like a top-40 DJ...rather, he sounds like a "morning zoo" DJ. Is he the host of Comedy Death Ray podcast? There, I might have tolerated him because he sounded so good compared with the notionally idiotic/crazy/deformed co-host character. A canonical "robot" is a thermostat: it senses its environment and attempts to change it on that basis. Another example might be a camera, an OCR system, and an input bus to get around the Captcha below. I've only heard two episodes, so far, but I feel compelled to say that Park Slope has found its very own "People's Court"
I like the podcast! Concerning the kitchen sink soap dispenser, why can't you wash your hands with dish soap? I do it all the time. Judge John Hodgman WILL grow on you. At first, I found John Hodgman smug and annoying. Now I see him as a saucy, irreverent little minx who, eventually, will mellow into the next John Houseman. Until his pert diction takes on the terroir of wisdom, until his piquant rapier wit is worn and tempered by the tenor of the passing zeitgeist-- just imagine him playing a smartass old school rich guy in commercials until he croaks. Long live the Judge! This podcast is excellent. But, I think it would be a lot better if it was just Hodgman and the plaintiffs. Jesse sounds like a top 40 radio dj and is completely out of place. The production otherwise is great though. Jesse's delivery threw me at first, but he's completely grown on me. His smart and timely comebacks match John's wit pound for pound. "Pizza & Pipes" is one of my favorites. He's cheesy sound fits the daytime courtroom show aesthetic to a T. I would like more subtle sound effects. For example, court audience murmuring when the Judge leaves for office. Either way, I'm delighted to find a new enjoyable show to follow while I study. I'm pretty sure John Hodgman is a jerk in real life. So it bothers me that he is usually very funny. If you look long and hard, you might find someone as nice as John. But you will never find anyone nicer. Au contraire - John Hodgman is a very nice person. I've met John Hodgman, and though a lesser man would have lobbed snarky comments at the multitude of dorks present in the room at the time, he was gracious, kind, and indulgent. I have it on good authority that he is a super nice guy. Sorry to disappoint! Just heard about your podcast from the good folks over at Stuff You Should Know, can't wait to check it out! Another recruit from SYSK Army! Subscribed & enjoying the show so far! Sorry, forget that last comment -- I see that the RSS link has been added. Could you please post the RSS feed?